Minton’s officially opens it’s doors today to the public in Harlem | HarlemGal Inc.
Minton’s, located at 206 118th Street, officially opens tonight! 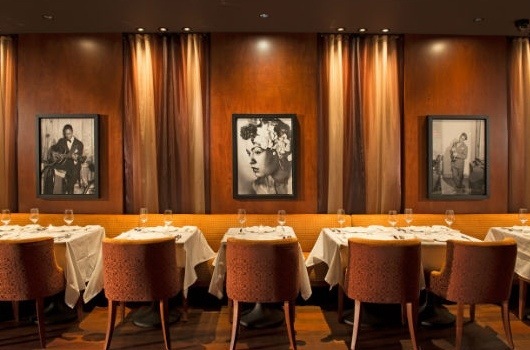 Minton’s will offer live jazz music nightly from the Minton’s house band. Minton’s will be open for dinner six days a week from 5 pm until 12 am, with three pre-set seatings each night. Reservations are required. Men are required to wear jackets. This entry was posted in Bars, business, entertainment, food, Harlem, Harlem bloggers, Harlem blogs, Harlem businesses, Harlem restaurants, HarlemGal, Minton's Harlem, The Cecil Harlem, Where to dine in Harlem and tagged Harlem, Harlem Blogs, Minton's Harlem, The Cecil Harlem. Bookmark the permalink. I’m very happy to see the resurrection of this spot – a true legend of its former glory. I can’t help but wonder how the “jackets required” rule vs. jackets recommended, coupled with the menu pricing that upon first impression seems to cater more to Wall Street types, will pan out in the long run. There are those of us (and there are many) who long to dress to the nines and dine in the spirit of the Jazz supper clubs of yore. In my opinion a “jackets recommended” notice in a time where dandy and starlet attire of the 30’s and 40’s is very much alive and well on the streets of New York City now in 2013 would suffice in encouraging a proper dress code while not excluding those for not having one. There is no doubt that Minton’s will be highly successful with the backing of owner and former Time Warner chairman Richard Parsons but will the future atmosphere foster those impromptu jam sessions that attract the nameless, penniless and unsigned musical virtuosos to drop by and sit in? Will it nurture improvisational magic and creativity of musicians and singers, in a similar spirit that Minton’s Playhouse did for inventors Monk, Coltrane, Davis, Ella and others? I’m excited for the possibility of that kind of revival and genuinely wish them only the best. As a lover of great music and musicality I was hopeful to become a regular but at the price points, I’ll settle on making reservations for extra special occasions.